HomeNews‘3 CloudCooler Group’ deployed by Etix Blockchain for new data centre in Iceland. Etix Blockchain, a division of Etix Group dedicated to provide colocation services for HPC and Blockchain applications and mining as a service capacity, have specified a large number of EcoCooling ‘3 CloudCooler Group’ modules for their new facility in Iceland. EcoCooling were selected based on the success of their CloudCooler® Range in other installations across the region, which has become a hotbed for data centre development mainly due to competitive power prices and cool climate. With its ambient air conditions, Iceland is an ideal location for data centers using the EcoCooling solution. A number of award-winning data centre and cryptocurrency mining operators in the Nordics and Arctic circle have used EcoCooling solutions to achieve unparalleled cooling efficiency. The ‘3 Cooler Group’ module has been developed off the back of these installations to be the most cost-effective option for rapid deployment developments in remote locations. The design complements Etix Blockchain’s scalable data centre design strategy while also maintaining world-class cooling efficiency. Watch the assebly time lapse video here. ECV CloudCoolers® (free cooling) units can maintain a reliable operating environment for computing devices in Iceland due to the cold climate. The ambient temperature rarely exceeds the supply temperature required by the computers. This means filtered, external air can be used all year round to cool the facility, eliminating the need for a supplementary cooling system. 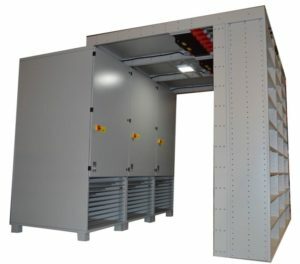 The CloudCooler units provide a constant supply of filtered air at controlled temperatures. Filtration plus the avoidance of temperature fluctuations maximise the reliability of the computers and other IT equipment. Utilising these key areas provide a dependable platform to maintain the maximum availability of mining power.